Did you know that SharePoint 911 is now part of Rackspace SharePoint Services? When you’re looking for the experts from SharePoint911, you’ll probably see them with Rackspace shirts on and often at the Rackspace booth. Also, they’re very active presenting, signing books and working with the community. The Rackspace booth is number #704 and it’s in the 6th row of exhibitors when you head forward with your back to the main entrance of the Exhibit Hall. 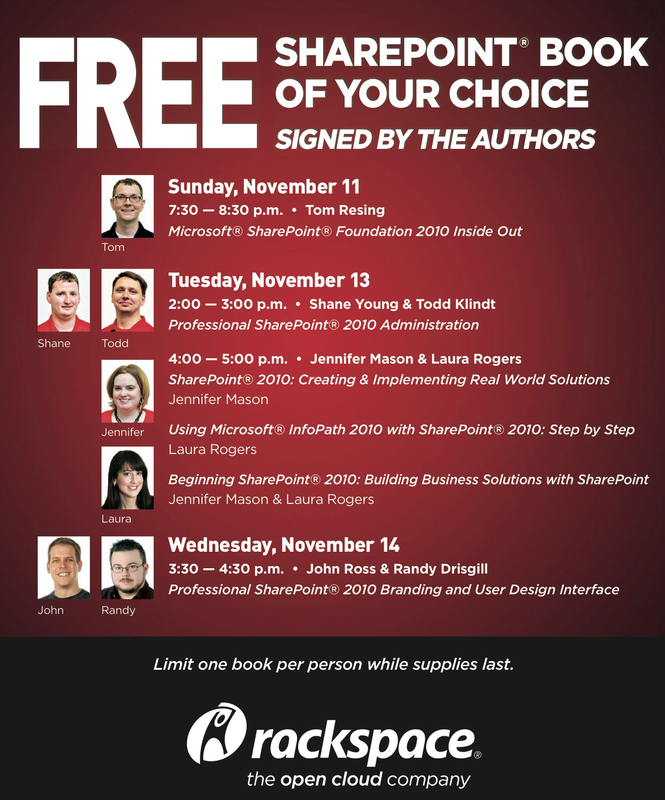 As part of the team, I’ll be doing book signings at the Rackspace Booth and the O’Reilly Booth and I will be volunteering at the Community Lounge for the San Antonio SharePoint Community. I’ll also be checking in at the Rackspace booth everyday when I’m not attending sessions. Look in your attendee bag for a coupon for a free, signed book from the Rackspace book. Bring the coupon to the booth at one of these times to claim your book. Quantities are limited, so line up early to make sure you get one. Rackspace employees are affectionately known as Rackers. This year Rackers will be making quite a few presentations. Watch out for special opportunities for session attendees. I hear there may be giveaways. This is a post conference session with additional cost – Registration. Jennifer Mason and Tom Resing will be at the Community Lounge with other SharePoint Community Leaders on Wednesday from 4:30-5:30PM. The Community Lounge is located at the back of the Exhibit Hall on Level 1, Bayside C. Event organizers say the Community Lounge is the place to be at SPC12 – aside from our time at the User Group kiosk, there will also be an interactive mural wall, an interactive timeline, book signings, and live interviews with top Microsoft personalities.